There are few things I look forward to getting in the mail as much as my food magazines. Last week I came home the newest issue of Food & Wine and didn’t even have to open it up to know what I was going to make for dinner over the weekend. 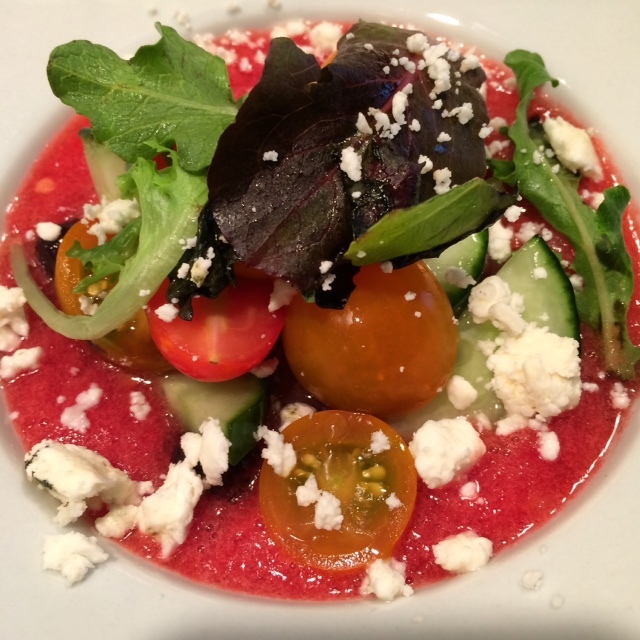 The cover recipe was a beautiful tomato soup with Greek salad garnish. The recipe is ridiculously easy to make and the payoff is huge. The flavors are amazing – especially the onions. Cooking them down tames the flavor a little bit so you won’t end up with dragon breath when you’re done. And because the base is just pureed tomatoes and nothing more, it’s extremely light. You could serve a good sized portion of this without it ruining your appetite for the main course. You don’t have to chill this before eating, so that’s a time saver. I did have leftovers the next day and have to say that the room temperature version was a little more flavorful. Chilling the soup killed some of the fresh tomato flavor, but it was still really good. What I loved about this was the combination of soup and salad in one dish. That’s kinda brilliant and has definitely got me thinking about what other types of soup and salad this could work for. I haven’t come up with anything yet, but surely when I do, I will post about it here! For full recipe and instructions, follow this link to Food & Wine.